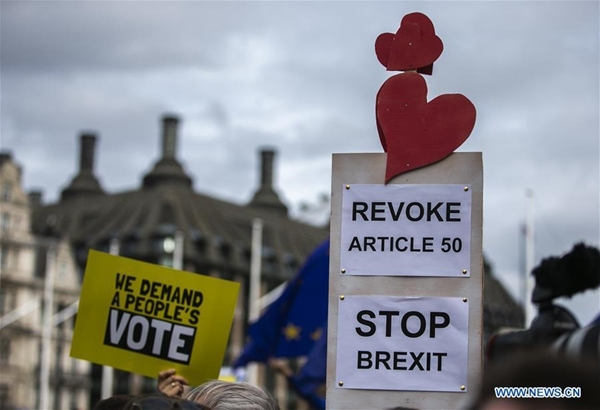 British Prime Minister Theresa May said on Monday that there is "still not sufficient support" in the House of Commons for a third vote on her Brexit deal. She made the statement at the House of Commons as the European Commission announced that it had completed its preparations for a potential no-deal Brexit on April 12, warning that scenario was "increasingly likely." May said that the government will oppose the amendment that would lead to a series of so-called indicative votes on alternatives to May's deal. May is expected to bring her Withdrawal Agreement back for a so-called third meaningful vote. However, the government had earlier said that it won't do that unless it was sure it had enough support to win such a vote.